Our sister publication Travel Weekly clearly thought Travolution sits around twiddling its thumbs much of the time, so asked me to guest edit its edition this week. I looked at some of the regular sections and decided to give them an online flavour. The news section also featured a far higher technology-online travel focus than normal. A radically different - some might argue, obviously Travolution in style - front cover was also created specially for the edition. Rather handily the edition will be the one circulated at next week's Travel Technology Show. Regular readers wondering why the editor of Travolution has been handed the reins of Travel Weekly for a special edition needn’t be worried. Martin Couzins, who usually has the weekly privilege of writing in this space, approached me with the initial idea of producing something slightly different to coincide with next week’s Travel Technology Show. 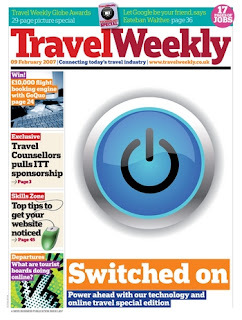 So while there is a focus on what you all might call ‘technology issues’, what you will read about in many of the pages in this edition of Travel Weekly is actually something broader. This week’s Mystery Shopper, for example, browsed the leading online travel agency websites; while the lead feature looks at the changing role of agents and operators in the ‘brave new world’ of the Internet. The Big Interview features arguably one of online travel’s most important men – Google head of travel in Europe Esteban Walther. Like it or not, his mammoth organisation has an enormous influence on how travel products are now sold. But why is it so important to suddenly home in on these issues? Travolution has spent the last 15 months focusing on the profound changes sweeping the industry, triggered primarily by the power the Internet now has over the lives of consumers. This has been happening for a while, you might say. Of course, this is true, with some online players celebrating more than a decade in business. But the travel industry is about to face new challenges. Take-up rates of broadband are now so high that the Internet is almost a constant presence in the home and workplace, meaning consumers are just seconds away from researching a holiday, looking for decent product and, ultimately, booking a trip. It’s a mildly controversial statement to make, but there are large parts of the industry that are still dismissive of this fundamental shift in the way people now interact with each other and travel companies. To ignore these changes, or fail to recognise how to meet the challenges ahead, could be a truly fatal mistake. It was actually a lot of fun putting the edition together, although coming a day after our own press day for the February edition of Travolution did test endurance levels a little bit.